The integumentary system is a biological system composed primarily of the skin, but also accessories that grow out of the skin (i.e. hair, scales, and nails). The skin is a vital organ that covers the entire outside of the body, forming a protective barrier against pathogens and injuries from the environment. The skin is the body's largest organ; covering the entire outside of the body, it is about 2 mm thick and weighs approximately six pounds. It shields the body against heat, light, injury, and infection. The skin also helps regulate body temperature, gathers sensory information from the environment, stores water, fat, and vitamin D, and plays a role in the immune system protecting us from disease. The color, thickness and texture of skin vary over the body. There are two general types of skin; thin and hairy, which is more prevalent on the body, and thick and hairless, which is found on parts of the body that are used heavily and endure a large amount of friction, like the palms of the hands or the soles of the feet. Basically, the skin is comprised of two layers that cover a third fatty layer. These three layers differ in function, thickness, and strength. The outer layer is called the epidermis; it is a tough protective layer that contains the melanin-producing melanocytes. 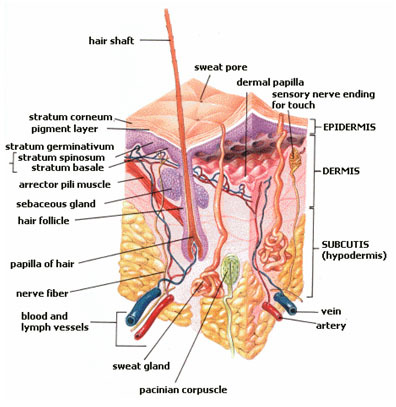 The second layer (located under the epidermis) is called the dermis; it contains nerve endings, sweat glands, oil glands, and hair follicles. Under these two skin layers is a fatty layer of subcutaneous tissue, known as the subcutis or hypodermis. The epidermis is the outermost layer of the skin, and protects the body from the environment. The thickness of the epidermis varies in different types of skin; it is only .05 mm thick on the eyelids, and is 1.5 mm thick on the palms and the soles of the feet. The epidermis contains the melanocytes (the cells in which melanoma develops), the Langerhans' cells (involved in the immune system in the skin), Merkel cells and sensory nerves. The epidermis layer itself is made up of sublayers that work together to continually rebuild the surface of the skin. The squamous cell layer is located above the basal layer, and is also known as the stratum spinosum or “spiny layer” due to the fact that the cells are held together with spiny projections. Within this layer are the basal cells that have been pushed upward, however these maturing cells are now called squamous cells, or keratinocytes. Keratinocytes produce keratin, a tough, protective protein that makes up the majority of the structure of the skin, hair, and nails. The squamous cell layer is the thickest layer of the epidermis, and is involved in the transfer of certain substances in and out of the body. The squamous cell layer also contains cells called Langerhans cells. These cells attach themselves to antigens that invade damaged skin and alert the immune system to their presence. The dermis is located beneath the epidermis and is the thickest of the three layers of the skin (1.5 to 4 mm thick), making up approximately 90 percent of the thickness of the skin. The main functions of the dermis are to regulate temperature and to supply the epidermis with nutrient-saturated blood. Much of the body’s water supply is stored within the dermis. This layer contains most of the skins’ specialized cells and structures. The hypodermis or subcutis is the innermost layer of the skin, and consists of a network of fat and collagen cells. The subcutis is also known as the hypodermis or subcutaneous layer, and functions as both an insulator, conserving the body's heat, and as a shock-absorber, protecting the inner organs. It also stores fat as an energy reserve for the body. The blood vessels, nerves, lymph vessels, and hair follicles also cross through this layer. The thickness of the subcutis layer varies throughout the body and from person to person. Basket Cells – Basket cells surround the base of hair follicles and can sense pressure. They are evaluated when assessing overall nerve health and condition. Blood Vessels – Blood vessels carry nutrients and oxygen-rich blood to the cells that make up the layers of skin and carry away waste products. Hair Erector Muscle (Arrector Pili Muscle) – The arrector pili muscle is a tiny muscle connected to each hair follicle and the skin. When it contracts it causes the hair to stand erect, and a "goosebump" forms on the skin. Hair Follicle – The hair follicle is a tube-shaped sheath that surrounds the part of the hair that is under the skin and nourishes the hair. It is located in the epidermis and the dermis. Hair Shaft - The hair shaft is the part of the hair that is above the skin. Langerhans Cells - These cells attach themselves to antigens that invade damaged skin and alert the immune system to their presence. 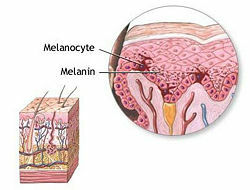 Melanocyte – A melanocyte is a cell that produces melanin, and is located in the basal layer of the epidermis. Merkel Cells – Merkel cells are tactile cells of neuroectodermal origin located in the basal layer of the epidermis. Pacinian Corpuscle – A pacinian corpuscle is a nerve receptor located in the subcutaneous fatty tissue that responds to pressure and vibration. Sebaceous Gland - Sebaceous glands are small, sack-shaped glands which release an oily substance onto the hair follicle that coats and protects the hair shaft from becoming brittle. These glands are located in the dermis. Sensory Nerves – The epidermis is innervated with sensory nerves. These nerves sense and transmit heat, pain, and other noxious sensations. When they are not functioning properly sensations such as numbness, pins-and-needles, pain, tingling, or burning may be felt. When evaluating a skin biopsy, total number, contiguity, diameter, branching, swelling, and overall health of the sensory nerves are assessed. Stratum Corneum – The stratum corneum is outermost layer of the epidermis, and is comprised of dead skin cells. It protects the living cells beneath it by providing a tough barrier between the environment and the lower layers of the skin. The stratum corneum is useful for diagnosis because in some conditions it will become thinner than normal. Sweat Gland (Sudoriferous Gland) - These glands are located in the epidermis and produce moisture (sweat) that is secreted through tiny ducts onto the surface of the skin (stratum corneum). When sweat evaporates, skin temperature is lowered. Science News reports that investigators postulate that fingerprints, or epidermal ridges, make the sense of touch much more efficient. Different nerve sensors catch different frequencies of vibrations as the finger passes over a material. The ridges on the fingerprints help filter the vibrations into certain frequencies, and the swirls help make certain that whatever direction the finger travels, at least some ridges are perpendicular to the direction of travel. A smooth sensor cover worked much less well than a ridged one. Fingerprints are thought to be just right to select the frequencies that work best with the nerve touch sensors. This page was last modified on 30 June 2010, at 22:22.